Much of what we know of as “the law” is held up by norms, not constitutional rules. Republicans appear hellbent on shattering those norms. On paper, Judge Brett Kavanaugh is objectively qualified for the job he seeks. Sure, his judicial philosophy is conservative, so he’s unlikely to vote in ways that expand individual constitutional rights or make liberals very happy. But that’s what happens when a Republican president picks a Supreme Court justice: the nominee is conservative. Kavanaugh’s confirmation hearings have nonetheless struck a damaging blow to the Supreme Court’s legacy and legitimacy. Thanks in large part to the efforts of the GOP, these hearings are no longer an open and honest forum for evaluating a potential jurist. Instead, we are witnessing a hypocritical, partisan circus. Much of what we know of as “the law” is held up by norms, not constitutional rules. In the past, Congress has adhered to a number of norms that foster fairness and bipartisanship in the Supreme Court confirmation process. Much to the detriment of the American democratic process, however, this Republican Congress appears hellbent on shattering those norms, to the extent that some Senate Democrats are accusing their Republican peers of purposefully withholding relevant documents. Much to the detriment of the American democratic process, however, this Republican Congress appears hellbent on shattering those norms. 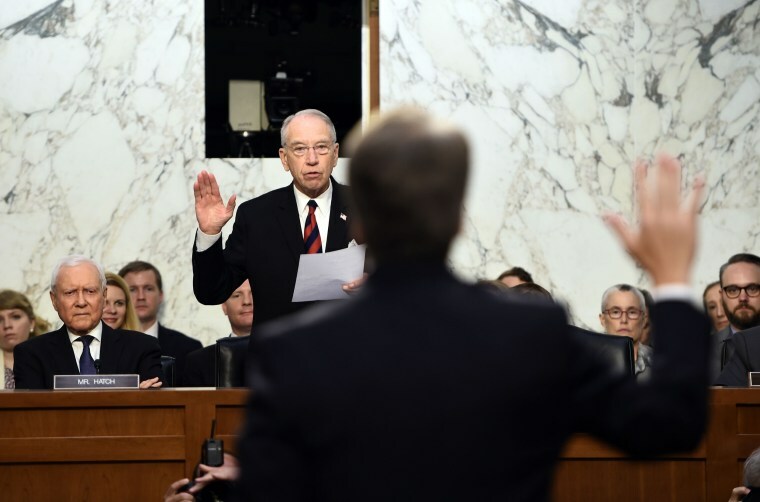 To be sure, the Constitution has very little to say about this particular confirmation process, other than to state that the president “shall nominate, and by and with the Advice and Consent of the Senate, shall appoint... Judges of the Supreme Court.” Nothing in the Constitution requires that the nominee turn over documents, or meet individually with senators, or candidly answer questions regarding hypothetical cases. Senators must decide for themselves how to judge candidates using personal criteria that may or may not include things like legal qualifications, character, diversity on the court and judicial philosophy. Since 1789, when the Supreme Court was founded, presidents have submitted 163 nominations, of which 125 were confirmed. Sitting on the United States Supreme Court was always supposed to be a privilege, not a right. Accordingly, Supreme Court nominees get much more scrutiny than other presidential appointments. Unlike a Cabinet appointee who can be fired, quit, or moved out with the next administration, the job is for life — by design. The notion is that if judges had to worry about reelection, their decisions could be marred by self-interest — on political or ideological grounds. With lifetime tenure, judges should be more likely to referee disputes based on the rules of the game and the facts before them — not on bias, prejudice, or a desire to concentrate their own power. This feels like a very naïve argument in today’s political climate. But the process has worked for well over two centuries because politicians abided by certain principles, not legal limitations. Indeed, there is no constitutional mandate that a nominee be brought to the Senate floor before the next presidential election, for example — or even within a certain number of weeks (think Merrick Garland). Nor is it constitutionally required that there be 60 Senate votes to stop debate on a nominee — a number that forces the majority party to take into consideration the views and concerns of the minority. Just a few decades ago, this process still worked relatively well. Take the most divisive confirmation in recent history — that of Clarence Thomas. Democrats did not resort to the filibuster with Thomas, despite the fact that the final tally of opposition votes would have been more than enough to defeat a so-called “cloture” motion to end debate. Even more incredibly, after four days the Senate agreed to reschedule its vote on Thomas to allow the Senate Judiciary Committee to hold hearings on law professor Anita Hill’s sexual harassment allegations against him. This was done by unanimous consent. Let me repeat: Republicans and Democrats unanimously agreed to stall the confirmation process and subject President H.W. Bush’s nominee to three days of separate hearings because of a sexual harassment allegation. I was a law student during the Thomas hearings, and my civil procedure professor’s speech about that episode stuck with me. As a matter of constitutional theory, he explained, if there was a credible concern over the nominee’s integrity — which there surely was in Thomas’ case, despite the ultimate outcome — he should be passed over for a lifetime appointment to one of the most powerful offices in the land. Likewise, it’s the gravity of the office that makes current Republicans’ “tribal-win-at-all-costs” philosophy so unprincipled. Consider Senate Majority Leader Mitch McConnell’s cynical refusal to consider a sitting president’s nominee, full stop, on a gamble that his party would retake the presidency in the next election. Or his party’s elimination of the 60-vote cloture requirement for Neil Gorsuch, effectively silencing the Democratic minority and its millions of constituents. And yes, the bipartisan norm-breaking includes refusing to disclose relevant records pertaining to Kavanaugh’s history to the full Senate — and dumping 42,000 documents on Democrats the eve of the hearings — making it impossible for both sides to conduct a thorough review of the candidate’s record. Republicans are also relying on George W. Bush’s lawyer — who also represents White House counsel Don McGahn, former White House advisor Steve Bannon and former chief of staff Reince Priebus in connection with Robert Mueller’s investigation of Russian interference — to decide what documents to provide to the Senate. Arguably, this is what gamesmanship in the harsh political culture of Washington, D.C. now looks like. But no matter how we got to this point, such gamesmanship carries very serious consequences. Professional sports are fun to watch because the rules of the game make losing fair. If confirmed, Kavanaugh will undoubtedly think independently on the Supreme Court bench, but his tenure will carry a pall. Through no fault of his own, when Kavanaugh casts his first 5-4 vote, approximately 44 percent of the country, which leans Democrat, will feel that they have been discarded, cheated and just plain hurt by the Republican caucus during this process. And they’ll be right. Kim Wehle is a professor at the University of Baltimore School of Law and a former assistant U.S. attorney and associate independent counsel in the Whitewater investigation. Her forthcoming book, "Debatable: A 'How To' Guide to the Constitution," will be published by HarperCollins in the Spring of 2019.